1.407" (35.75mm) OD x 1.289" (32.75mm) ID x 0.354" (9mm) length x 89.8° angle. Set of 4 pieces, 2 North / 2 South. N50 Rare Earth Neodymium Arc Magnet, Radially magnetized. Nickel plated. Arc Magnets are primary used as motor magnets and generator magnets; however, their uses are also as pump magnets, sensor magnets, and automotive magnets. 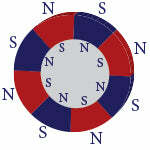 When used as a motor magnet, arc magnets can be arranged is a circular pattern with alternating north and south poles. Arc motor magnets must work seamlessly with your entire motor or generator, including the laminations, number of poles needed, wire size, and surrounding components. Choosing the correct magnet will ensure the most efficient operation of your motor or pump, and provide the desired torque, RPM and output you need. Arc magnets used in pumps (fluid handling) need to achieve the coupling effect desired at the defined air gap. The fluid being moved by a pump will determine the coupling required. And arc magnet coatings will be a critical piece to consider in pumps if the pump is moving harsh liquids. SM Magnetics, the engineering and manufacturing sister company of SuperMagnetMan, has been assisting Corporate customers for many years with their custom arc magnet applications. This includes motor magnets, generator magnets, pump magnets, and magnetic assemblies. SM Magnetics works with Corporate customers to optimize their design and then manufacture the specific arc magnet or magnetic assembly to meet the required specification. SM Magnetics has their own ISO certified factories and controls the entire manufacturing process when making individual magnets or entire magnetics sub-assemblies. For assistance from a technical representative at SM Magnetics, click here for the contact info. Need assistance from SuperMagnetMan and its technical magnet staff with your neodymium arc magnet requirement? Contact us, or use our online custom magnet quote form to start the discussion.